I thought I missed out on this issue and when I saw it at the Philatelic Booth at the current book expo at ICC, I grabbed this. 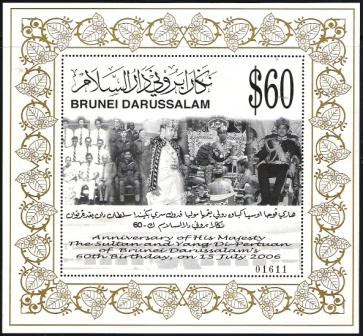 This is the second of very high value miniature sheet produced by the Brunei Postal Services. The first was a $50 issue issued during His Majesty's 50th birthday. This $60 miniature sheet is produced for His Majesty's 60th birthday. I am not sure how many are produced but not many people would want to buy it. The Postal Services actually sell this with a golden coloured wooden frame and they are not selling it at $60. The selling price is $260 and for that price only an enthusiast would want to buy it. Anyway, I am sharing this one with all of you out there. This is a very unusual M/S item. I wonder if a used one woulb be more valuable to one in mint condition? Probably. The authorities sell it framed and I guess not expecting it to be used. I can't imagine much item posted at that rate. then having one posted and received would probably appreciate its value a few folds? No doubt - and the shorter the period of its intended usage period the higher the value it is in the "used" condition. Love your blog, mate. I got one each of $60 sheet & the $40 sheet without the serial number overprint. Is there & why is there 2 version with & without an serial overprint ?